World Record group shot by Bart Sauter in IBS 600-yard Match on April 21, 2018 in Memphis, TN. What can we say… this 0.282″ 5-shot group 600 yards represents one of the most impressive feats of rifle accuracy in history. Shot in competition, this five-shot group at 600 yards easily fits inside a dime with plenty of room to spare! 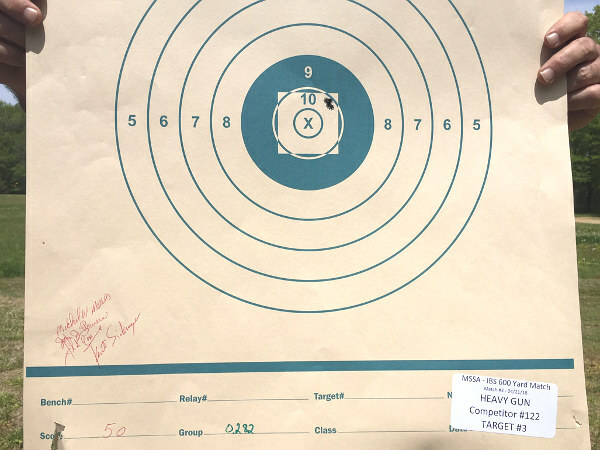 Bullet-maker Bart Sauter recently shot this 0.282″ five-shot group at a 600-yard IBS match. Yep, you read that right — 0.282″ at 600. Most shooters would be happy with that group at 100 yards. At 200 it would be remarkable. But at 600 — it is truly amazing. Readers, 0.282″ at 600 works out to 0.04 Minutes of Angle (MOA). Not point four MOA, but point ZERO four MOA, and it was all in the TEN RING for a 50 score. Even measured outside edge to outside edge, that group is just 0.525″, so Bart’s group will easily fit inside a dime (0.705″ diameter). Sauter’s amazing 0.282″ 50 group smashes the existing IBS Heavy Gun 600-yard record, a 0.404″ shot by John Lewis way back in 2008. It also happens to beat the existing IBS Light Gun group record — the stunning 0.336″ by Rodney Wagner in 2013. (A group many said could never be bettered). Bart’s group will be a new score record too — many 50s have been shot before, but the group size is the tie-breaker, and no one has ever shot smaller at 600 than Bart. On the 21st of April, at the beautiful Memphis Sport Shooting Assn. 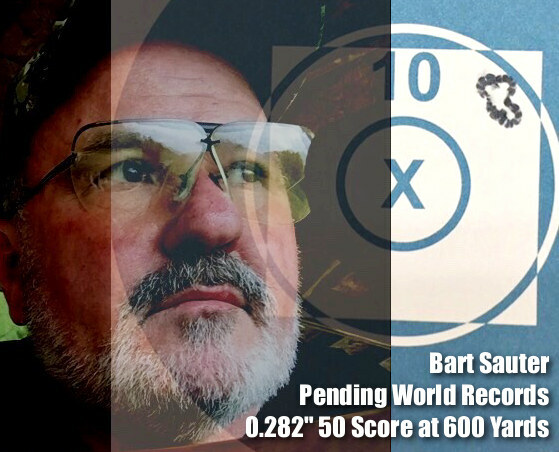 600-yard benchrest range, bullet-maker Bart Sauter made history. About 11:00 O’clock with 12-15 MPH switchy winds, Bart Sauter waited for his chosen condition and then ran five shots into an incredible 0.282″ record-breaking group, with a score of 50. Shot in Heavy Gun Class (with his Light Gun), this combination of group and score bettered the previous HG group and score records with sufficient margins that their records in both categories are virtually guaranteed. The previous group record, a 0.404″, belonged to John Lewis and stood for ten years. The previous score record was 50/.513 (group size being the tie breaker) shot by B.J. Francis last year. Bart’s target was 50/.282. 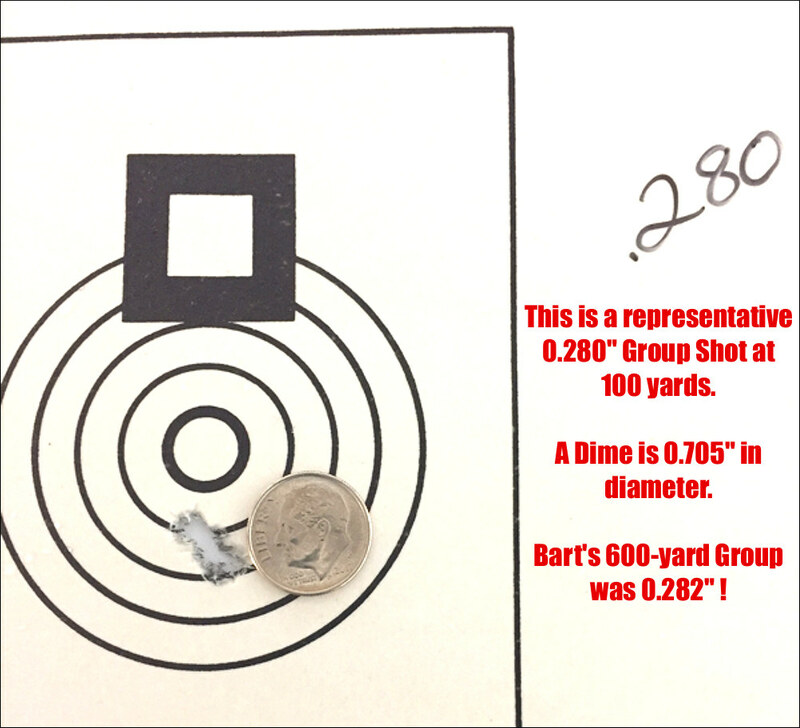 To put it in perspective Bart’s record has the equivalent angular dispersion (MOA) of a .04″ group shot at 100 yards. (Bart’s exact MOA is 0.0448) But consider that crosswinds have roughly 36 times more effect at 600 yards than at 100 yards (by the “Rule of the Square”). 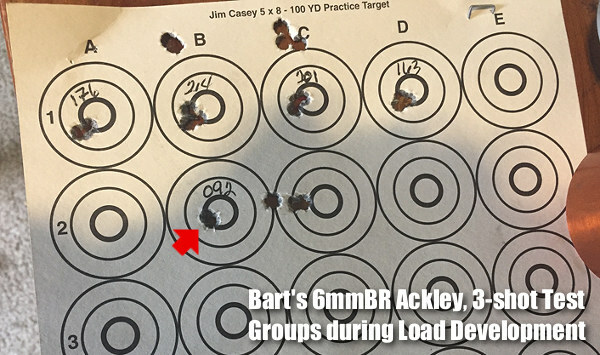 Bart shot a 6mmBR Ackley Improved (6BRA) wildcat cartridge with an 0.272″ neck. This is basically the 6mmBR Norma with a 40° shoulder. The neck is long like the parent cartridge, not short like a 6mm Dasher. Bart was shooting his own 105 grain, 13 Ogive VLD bullets. He calls this new bullet design “The Hammer” (for good reason). Bart’s Hammer 105s were loaded in Lapua brass with Hodgdon H4895 powder and Wolf primers. Bullet tips were trimmed on a Giraud bullet point trimmer, but not pointed. Bart feels that there is too much potential for damaging bullets during pointing, so he does not point his match bullets. Bart had his LabRadar chrono on the bench during the match. Velocities were 2970-2975 fps with single-digit ES. Bart’s rifle features a melonited BAT B action, with a 26″, 1:8″-twist, HV contour James Lederer barrel, fitted with a Mike Ezell tuner. The Jewell trigger was set to 1.5 ounces. On top was a March 40X in BAT rings. The initial build was by Mike Moses, with chambering by Dean Stroud, and final (glue and screw) bedding by Billy Stevens. The handsome wood JB 1000 stock (3″-wide fore-end) boasts an aluminum keel added by Alex Wheeler after the initial build. Bart said that it only took him 15 minutes to adjust the keel so that the cross hairs did not wiggle on the target when the gun was pulled back a full 2 ½ inches. Bart is definitely a fan of the adjustable keel. Bart used a Farley Coaxial front rest with soft leather Edgewood front back sprinkled with baby powder. In the back was a Protektor Model DR rear bag with Cordura ears and no added lube (not needed with aluminum keel) borrowed from Mike Moses. Bart shot the rifle lightly pinned between his shoulder and the fore-end stop. Interestingly, Bart kept his Labradar chronograph on his bench throughout the day, and recorded velocities during the record group: 2970-2975 fps with single-digit ES. After firing, cases are annealed with a Benchsource flame annealer. The inside of the case-necks are brushed with a nylon brush (no lubricant is used). Cases are sized with a custom Whidden Full-length sizing die (with bushings), and a cut-down Wilson micrometer seater that was originally made for the Dasher. 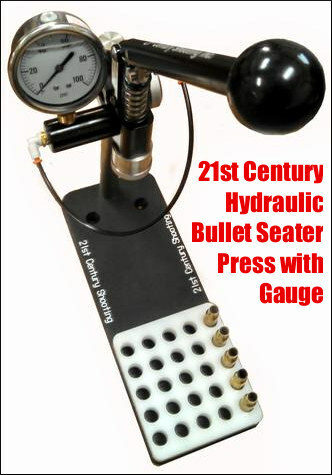 Bullets are seated with a 21st Century Shooting Hydro Bullet Seater, used with the Wilson cut-down Wilson seating die. This state-of-the-art arbor press boasts a hydraulic seating pressure cylinder and gauge. During seating, the force gauge reads about 27. The powder charge is first thrown from a manual measure and usually trickled onto an A&D 120 FXi magnetic force restoration scale using an Adams automatic trickler, but this time Bart had to settle for his old RCBS trickler because the drive band of the Adams auto-trickler wore out. Brass Prep — The chamber is a 0.272″ no turn. Bart lightly skims the necks AFTER the first firing just enough to achieve batch to batch uniformity in neck thickness. He uses a .266 bushing which gives him .003 neck tension. I asked Bart if he pre-loads, or loads at the range. Unexpectedly his answer was “Both…depending”. Bart will identify his “in tune” velocity at his home range and then pre-load that load before the match. However, Bart takes all of his reloading equipment to the match, and if the conditions are such that his pre-loaded ammunition does not give the velocity he wants (as revealed by the LabRadar), he will load at the match. Another test that he feels is important is to be able to pass a bullet all the way through the neck of his fired cases. Bart thinks that even if the shank of a seated bullet does not directly contact a doughnut, that doughnut can have a negative effect on accuracy. 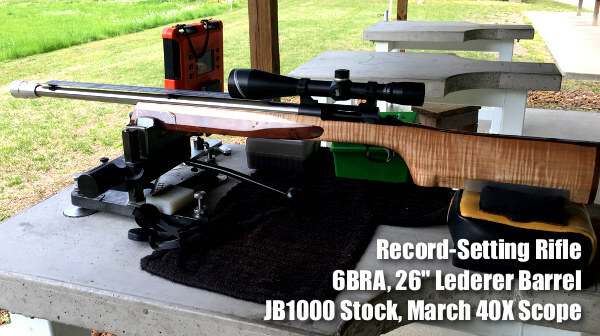 Bart has brought short range benchrest know-how to 600-yard competition. He uses a full set of short range flags, shown above. 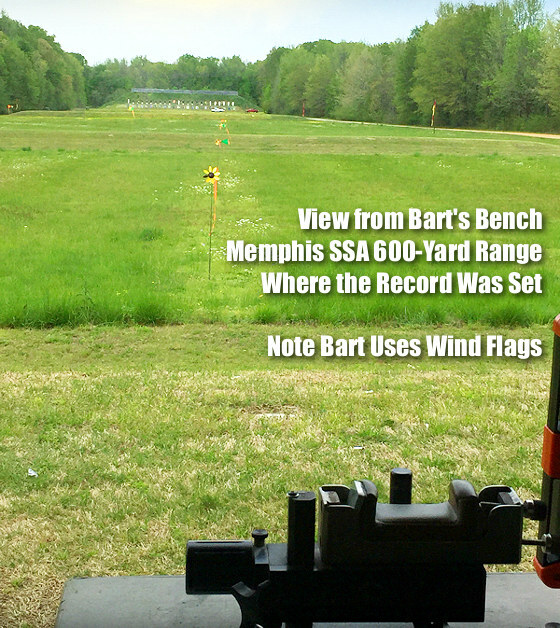 At last year’s Nationals, at the same Memphis range, Bart was one of the only shooters with a set of flags. Now other 600-yard competitors are following suit. Given its prominence, it is inevitable that comparisons be made between the 6mmBR Ackley Improved and the Dasher. On this subject Bart told me that, based on his experience, he is a “Dasher basher”. He believes the Dasher can be finicky, and has a tendency to flip shots out of the group. For Bart, the 6BR Ackley has been a lot easier to work with and more predictable. Below is a test target Bart shot at 100 yards. The load yielding the smallest 3-shot group, measuring 0.092″, was the load Bart took to the match. As you can see, the positions of the various load adjustments did not change on the targets. Bart said that that is the kind of positive compensation that he likes to see. Finally, I would like to add my congratulations to Bart Sauter for this spectacular group. I also want to thank Bart for generously taking the time to share the details of his load, reloading methods, and rifle components. 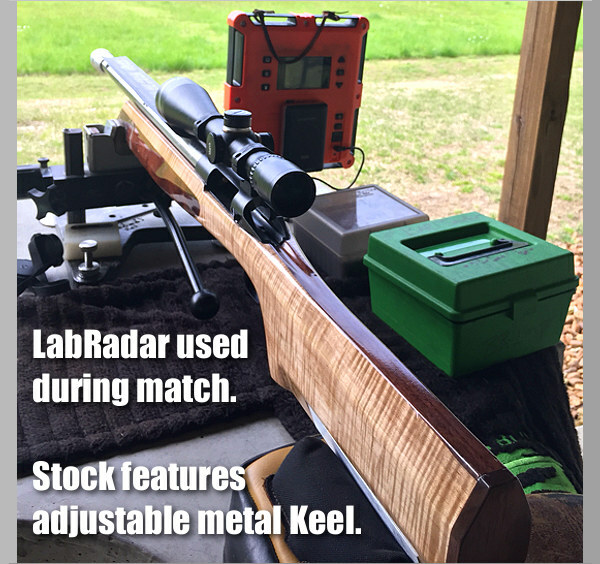 Bart has shown that applying some short-range benchrest techniques to the mid-range game can produce remarkable results. 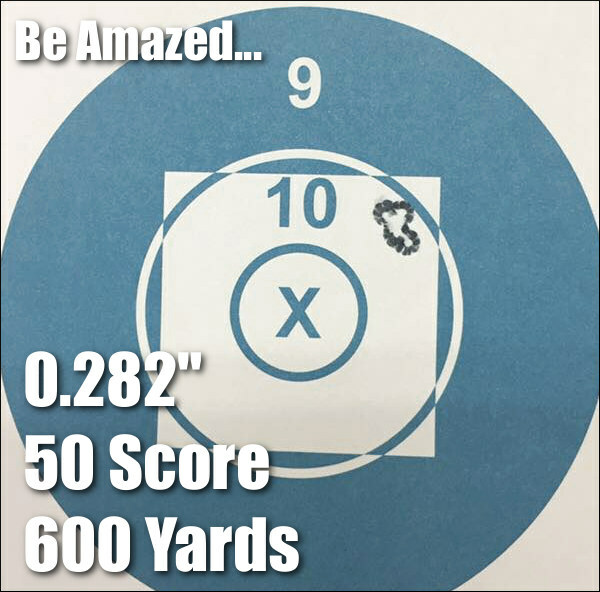 Share the post "Amazing Accuracy — Sauter Shoots 0.282″ Group at 600 Yards"
Let me be the first to congratulate Bart on his POINT ZERO FOUR MOA group. I thought I was a good shot getting a deer every year!! Excellent work from a Kentucky Rifleman! I can’t even wrap my brain around that 600 yard group. Holy cow! Bart you are The Man. I think this is a nail in the Dashers Coffin. Good shootin’ very, very, very, good shootin’!! is that means zero neck tension…?? Editor: This means that Bart believes a doughnut (thickened brass) at the neck shoulder junction of the case will negatively affect accuracy even if the full diameter section of the bullet is not contacting the doughnut. Is it too tight to get 27 psi? That is great shooting, but he had a custom rifle, on a bench rest with a 40x scope. When I competed on a National Match team in the Navy, we shot at 600 yards, prone, with a 7.62 NATO M1 Garand with 1/2 MOA iron sights! We weren’t shooting dime-sized groups, but we could keep all our rounds on a torso-sized target 600. I’d like to see what this guy could do with that equipment. John “back-in-my-day” Flynn: My apologies if I misunderstood the intent of your post, but it comes across as disrespectful; as though you don’t appreciate the difficulty of his accomplishment and think that it’s because of his equipment. The joining of perfect preparation, flawless judgment in steering the gun, and a certain element of luck resulted in his record. If it were just the equipment, then groups like this would happen more often than they do. Congratulations on this amazing record group at 600 yards. I’m happy for you and proud of you. No one has worked harder and is more deserving of all you have accomplished. You are a class act my friend! Wow Wow that’s just Wow.